I enjoyed Taste of Chicago so much during my first time there last Friday that I went back again tonight. It was also the annual 3rd of July Fireworks tonight. I later learned that this can get a little crazy and a person was killed last year in a shooting after the fireworks -- why didn't I know this ahead of time? Anyway, there was another incident tonight. It was at Congress and Michigan, and I witnessed it unfold as I was leaving the fireworks. An altercation of some kind broke out between a few individuals. In seconds, 10-20 people got involved and it turned into a bigger fight, and this was as thousands of people (a million attended total) were in the streets. So police jumped on this pretty quick. The Tribune reports that about 30 police broke it up, and that sounds about right. They flocked to the scene, from all directions, a few even pushed me out of the way to get there...and they formed a barricade to block people off from the area. The shocking part for me was what happened next - cops started beating people. I was not prepared for that. And it was this huge mob scene, with people starting to jump on top of ledges on Michigan Avenue to get a better look. It looks like police got it under control, but not before there was considerable chaos, shouting and physical violence as I said. Fortunately, no guns, or if there was, nothing happened on that end. Also had Pepsi and Mountain Dew Wild Fruit from the beverage stand. And.... I sampled 7 new, never-had-before Mountain Dew flavors at Mt. Dew Labs Tent for free! They were very good. There was an orange, citrus-type drink that was my favorite. Others included a cherry kind, green apple, etc. And at the Pepsi Tent I tried free samples of apple soda and grapefruit soda. The apple soda was actually pretty good. 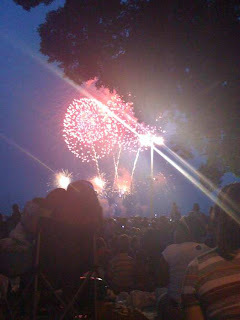 I also caught part of a concert with patriotic tunes before the fireworks, which I saw by the lakefront. Smiley face fireworks were most popular. There was a crazy lady next to me yelling every time someone stepped on her blanket, swearing like mad at everyone, kind of comical (wearing the white shirt on the right in this picture). And the coolest part was the grand finale because at the very end, you could still hear the fireworks echoing off the city buildings. Overall, a fun night and a good time last week at the Taste of Chicago. 5 comments on "Taste of Chicago and a crazy fight"
Police Brutality huh? The Police should have let the fight continue. And then you would have been complaining about how the police didnt stop the fight. Also, since your an expert on police use of force you may want to drop a resume off at the police academy as an instructor. Monday morning quaterbacks...if you havent wore the shoes then you dont know how they fit. While you enjoy your freedom & safety in this country, try and remember who stands between you and the people who would do you harm. There is no such thing as half measures. Peace. Why didn't they just shoot 'em?